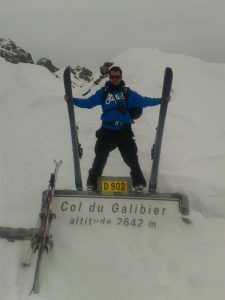 One of the classic Alpine road biking cols in the summer, the Col du Galibier makes for wonderful ski touring in good spring conditions when approached from the south. The route starts on the Briancon side of the Col du Lautaret and takes a much more direct line than the summer road’s sweeping ziz-zags.On the descent the steeper and more open upper slopes lead to tight winding valleys that take you onto the pastures above the Lautaret. 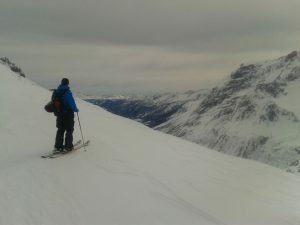 On transformed spring snow you can really let the skis go and enjoy a fast, varied ski. Unfortunately, on this occasion in March last year, the snow conditions were not so friendly. Hazy layers of cloud formed and thickened throughout the morning, blocking out progressively more of the weak sunshine. This meant that despite mild temperatures the surface of the snow didn’t really transform so we were skiing on breakable crust instead of spring corn. Flat light and poor visibility added to the unpredictability of the surface making challenging work of what should have been an easy ski. That said, the ascent was enjoyable, and Paul hadn’t been to the Col before so it was still a worthwhile day out. Hopefully I’ll repeat the trip next winter and be able to post some pictures of the Galibier in sunshine.